VRaymtl maps baking script, – dabarti. Creates VRayMtl with all textures correctly assigned. 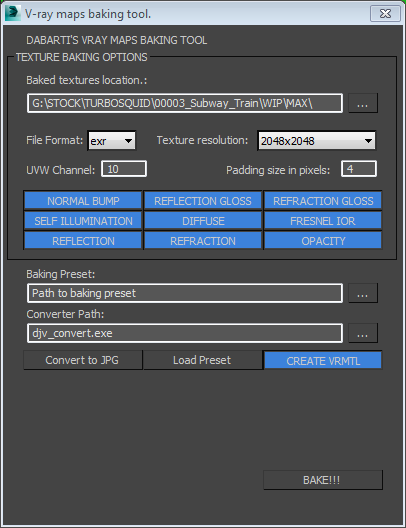 Ability to load custom render settings preset for baking. It reverts back to old preset. – Renders faster. When all this mess is baked into maps, you get simplified result that in general render faster. – Easier to share. This also opens up options to convert your shader to VRMat and use it in Maya / Modo etc. – More flexibility. Baked maps could be used for other things like exporting model to real time engine or other renderers. Select model you want to bake textures from. Choose only maps that you need (right click to deselect all). Make sure you have correct mapping channel selected. If you want to use different rendering settings for baking, create preset and assign it in the script. It will use it at render time and reload previous settings at the end. Camera based maps like falloff won’t work. This script will bake complex VRayBlend shaders down to Single VRayMtl, but reflections, glossiness etc will be averaged and result may be different than original. You don’t need lights / shadows / GI in your scene. This Script is free of charge. I just hope it will help your pipleline in the way it helps us. You can modify it, but please let me know and share your code. So we can improve it further. Just remember: this Script cannot be resold in anyway. Fixed: Custom path now is correctly assigned. Before it rendered to wrong directory. Fixed: Cancelling fixed. Now you can execute script 2 times in a row. Added: After each segment of baking Cancel popup appears and user has 3 seconds to cancel execution. Fixed: Checking for existing channel. Added: Option to convert exr to jpg after rendering. Added: Option to select baking preset. After rendering is finished, script reloads previous settings. Added: “Select object for baking” popup if nothing is selected. Added: “Mapping channel doesn’t exist” popup if UV doesn’t exist. Added: Script now saves current settings and loads preset from G:\GFX\VRay_preset\backing_basic_preset.rps after render is finished it loads back the previous settings. Next PostAlchemy for concept sketching. Any chance of this ever being rewritten for corona? looks awesome! This script is not meant for that. You can bake complete map with usual 3ds Max bake tools. This one is meant more for creating PBR / VRayMtl shaders without lighting information baked in. I have a problem: I try to run the script on a object but it says “Mapping channel does not exist”… Actually I don’t have a mapping channel 10 on my object, but I can’t change it on the script window… It accepts only 10… Also, I’ve used mapping with Vray triplanar mapping: does it works? Create mapping channel 10 with you non-overlapping nice UV and it will bake it down using that mapping. You can move it later on to channel 1 or any other, but I used 10 as most often lower channels are used for shading. Thanks Tomasz. But my problem is that the script doesn’t work. When I click on “bake” it says “Mapping channel does not exist”… Where I’m going wrong? Maybe I must add an unwrap modifier on channel 10 on the object? yes you need mapping on channel 10, just move your existing mapping there. Great Tomasz, got it now. Thanks. One last question: this is not a “render to texture script”, isn’t it? I mean, it bakes maps with GI and shadows applied. It’s not possible with your script to get only diffuse filter or reflection filter, just like the classic 3ds max “render to texture” uh? No it’s not classing render to texture script. I mean it does use that functionality, but it does not store shadows, GI etc. Under the hood I basically convert the shader tree in the way that makes it possible to some passes there were not possible to with typical render to texture. Like reflection or IOR . 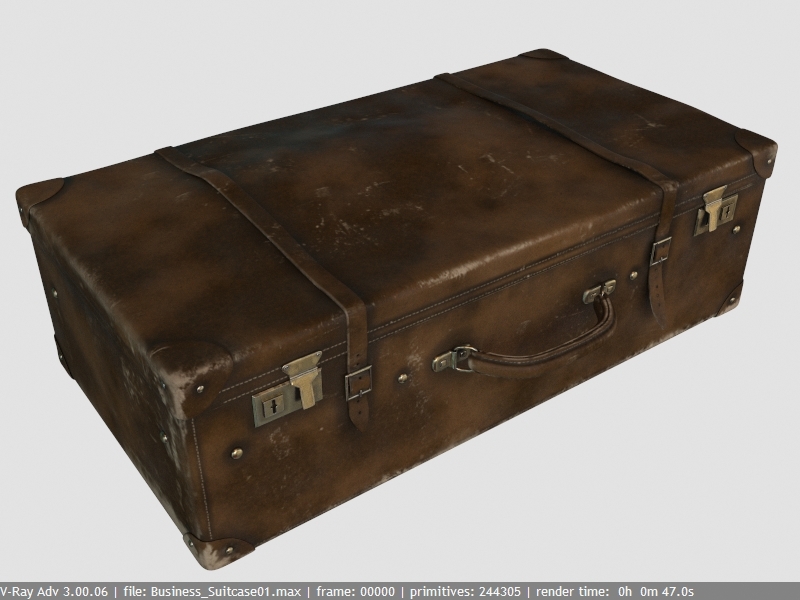 Idea behind it was the ability to bake the complex shading down to simple set of textures that could be used to create one V-Ray shader that could be easily exported to Unreal or other engines that supports PBR. Keep in mind that this is very old tool, though it should still work just fine. I was thinking about creating commercial version with extended functionality, but I’m just not sure if there is enough interest. Hi Tomasz i ve tried running your script in MAX 2017 but no pop up window apperars…any idea whats wrong? Hi Martin, It should work fine in 2017. I’ve just checked on my and and it’s starting up fine. Try to reinstall it. Hi Martin, do you just drag an drop the script in the viewport or select, run script?